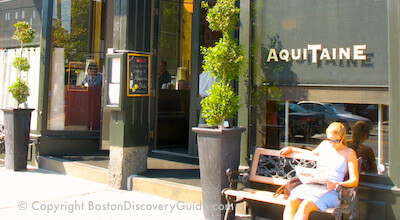 Want to experience the perfect French restaurant without leaving Boston? 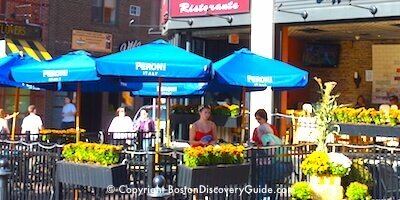 You can choose from numerous options scattered throughout the city, as our culinary scene evokes Boston's cultural ties to France going back to the American Revolution, when the Marquis de Lafayette persuaded the King of France to send ships, arms, and supplies in support of the quest for liberty and the fight against the British. Whether you crave elegant candlelit dining or a cozy Paris brasserie, haute cuisine or Provençal favorites, Boston's French restaurants and bistros serve up plenty of tasty options. Combine all this with the best New England seafood, freshest local vegetables, and romantic ambiance, and suddenly you have something unique - French cuisine with special Boston flavors. So check out the choices below, organized by neighborhood, and sample Boston's best French restaurants for a taste of France with a New England twist. Mistral's lushly romantic interior combines with great French food and wine to make it a top choice for special occasions - and any other time when you want to splurge on fine dining. Chef/owner Jamie Mammano prepares fresh local and regional products with a Mediterranean flair and classic French culinary precision. Each entrée is paired with something wonderful - roast rack of lamb with green beans, heirloom tomato and feta salad, and oregano, for example - and cooked to perfection. Expensive - and worth every penny. The multi-course, prix-fixe menus at L'Espalier, a fabulous French restaurant in Boston's Back Bay change frequently - but regardless of what's being served, you can be certain that your meal will be extraordinary. Recent main course options include smoked organic chicken with grilled mushrooms, baby carrots, and avocado and lobster crostini . . . roasted rabbit with potato gnocchi and peas . . . beef tenderloin poached in port with ravioli and mushroom consomme. Several menus, including a vegetarian menu and a tasting menu, with and without wine pairings are offered. A la carte options are available for lunch only. If you're visiting Boston for Thanksgiving, be sure to check out L'Espalier's special Thanksgiving dinner menu with wine pairings. Aquitaine's high-ceilinged space welcomes French bistro fans with light, warmth, and gorgeous gold-stenciled mirrors. Look for steak frites, lemon sole meunière, and escargots de Bourgogne on the oversized chalkboard, and enjoy the fresh local and New England ingredients - along with plenty of butter, herbs, and other French touches. You'll have a hard time remembering you're in Boston's South End once you walk through the door of Gaslight, almost a dead-ringer for a Parisian brasserie. Order your favorite drink, and get ready to enjoy classic bistro fare - onion soup, escargots with garlic and parsley butter, croque-monsieur, duck confit, luscious fruits de mer platters, steak tartare, fondue. And of course, mousse au chocolat. 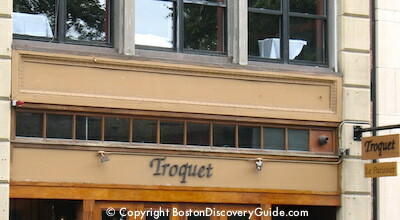 Troquet, a sleek and stylish French restaurant overlooking Boston Common, transforms fresh New England ingredients with modern French cooking techniques. Because of the rare vintages in Troquet's outstanding wine cellar, you could think of it as a wine bar that also serves food - but that would not do justice to Chef Scott Hebert's excellent cuisine. The menu lists suggested wine pairings for each course, but will customize choices to your preference. Another plus - Troquet is unpretentious and non-stuffy. You will have an enjoyable evening even if you can't pronounce anything on the wine list. Open only for dinner, Tuesday through Saturday. If you're looking for great wine and music in a superb French restaurant, Boston favorite Les Zygomates in the Downtown Leather District may be exactly what you want. Dinner options include appealing fish, meat, and game options, cooked nicely and paired with complimentary vegetables. Steak frites with herbed garlic sauce and truffled frites is outstanding. The vegetarian option features crepes with veggies, goat cheese, and bechamel sauce. The French bistro food is indeed delicious. . . but the wines and the live nightly jazz are the big attractions. 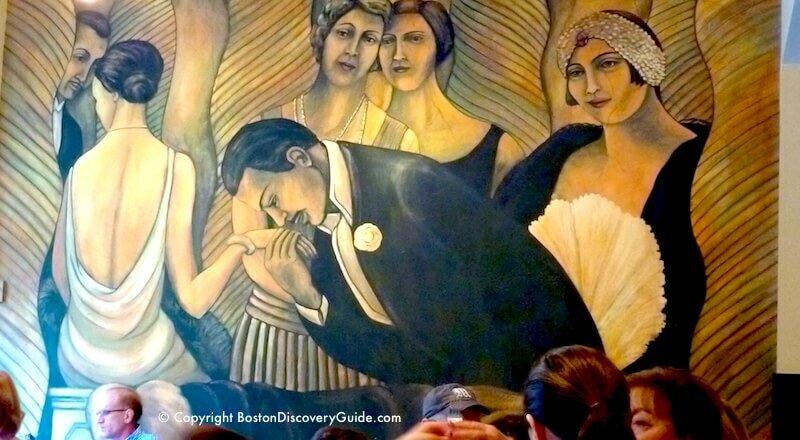 If you’re visiting Boston and love great wine, great food, and live jazz, a evening at Les Zygomates could be the best way to end a day of sightseeing. Known for its food and wine pairings at the renowned Boston Wine Festival hosted by Chef Daniel Bruce for 3 months each spring, Meritage is a superb restaurant that showcases locally sourced ingredients. Although little on the menu overtly suggests French cuisine, you can see a Francophile influence in the classic cooking techniques, precision, and attention to detail. Boston Harbor views from the dining room are magnificent, but they are easily eclipsed by food. Tucked away on Beacon Hill's fashionable Charles Street, The Hungry I features beautifully set tables in cozy candle-lit dining rooms complete with fireplaces in a charming 1840s brownstone. When the weather is good, you can opt for outdoor dining on the hidden vine-covered patio. The ambiance is romantic, and the cuisine is traditional French gourmet, updated to reflect current trends and fresh flavors. Some dishes such as the flambeed venison au poivre noir and duck l'orange have graced the menu for decades, while chef/owner Peter Ballarin changes others daily based on what's fresh in the market. Perfect place for a memorable leisurely dinner, while lunch and a prix-fixe Sunday brunch offer excellent value. Located in the space formerly occupied by Pierrot Bistro on the edge of Beacon Hill close to Mass General and TD Garden,Ma Maison is chef/owner Jacky Robert's latest contribution to the French dining scene in Boston. Like Chef Robert's other Boston French restaurants in recent years, Ma Maison combines traditional French bistro cooking techniques with updated interpretations. On the menu, you'll find traditional favorites such as braised short ribs Bergundy and an amazingly great rendition of French onion soup along side a few surprises, such as Asian accents and tropical fruit- similar to what you might see in many Parisian bistros. And like Chef Robert's other restaurants, ingredients are fresh and local, wine choices are on the mark, and prices are affordable. Styled to emulate a French brasserie in a wonderfully open space with brick walls and a soaring ceiling, Bastille Kitchen serves French classics - but with an innovative twist. Bastille Kitchen's French chef serves up bistro fare such as coq au vin, paté, and salade niçoise. 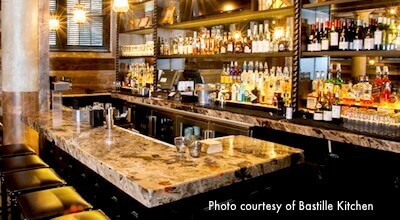 And like a true Parisian brasserie, the bar offers an extensive selection of French wines, calvados, armagnacs, and cognacs guaranteed to delight every bon vivant in Boston.